The Queensbury Hotel, centrally located between Saratoga Springs and Lake George, has been a focal point of the Glens Falls region for close to 100 years. The Queensbury Hotel, according to local historians, is named after the British Queen Charlotte. The parcel of land that is now Glens Falls was granted in 1762. The hotel’s name was given to honor that grant. That is one theory. Another theory, regarding the hotel’s name, is that “Queensbury” sounded elegant. The English-sounding name had a broad appeal regionally. Starting in 1916, the local Chamber of Commerce, local businessmen, and city officials desired a hotel to be built, not only to host Adirondack tourists and national businessmen, but also to serve as a community center for the city of Glens Falls. On March 6, 1924, in an unprecedented show of business and civic teamwork, 100 representative businessmen met at the Glens Falls Insurance Co. and unanimously voted to organize the Glens Falls Hotel Corporation and build a $600,000 modern hotel where later that year construction would start. The project was given impetus by the announcement that the Glens Falls Insurance company offered to purchase $50,000 worth of stock and that Finch, Pruyn and Company, the area’s leading industry and employer, would match that and in only eight days $440,000, roughly $6 million today, was raised. The enthusiasm, organization, and quick success highlights the vigor of boosterism in Glens Falls during the early 1920s. This success also points to the determination of local entrepreneurs and civic-minded residents to erect a city center landmark suitable for conventions, concerts, entertainment, and other social events to promote civic pride in Glens Falls and Warren County. Over the next couple of decades, the Queensbury added more guestrooms and meeting room facilities in order to accommodate the demand of business in the Adirondack Region. The Queensbury Hotel is not only a popular hotel choice for families and businessmen, but celebrities as well. Well-known performers such as Bob Dylan, Louis Armstrong, and Kenny Rogers have all called the Queensbury Hotel their “home” at one point or another throughout the hotel’s 90 year history. 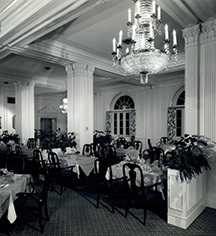 Benny Goodman and Guy Lombardo would give performances in the hotel's ballroom. Kenny Anderson, Joe Frazier, and Jackie Robinson are some athletes that have visited the area and choose to stay with us. Politician Robert F. Kennedy promised to return to the Glens Falls region, win or lose, after the 1964 election for Senator. The day after he won the election, Kennedy fulfilled his promise and showed up to a luncheon at the hotel to promise to help the growth of the surrounding areas. 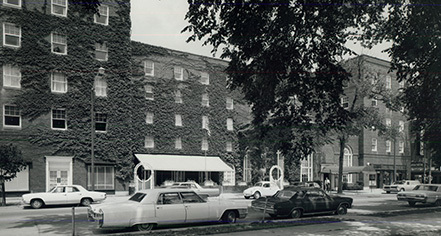 Over the course of 90 years, the hotel has changed ownership several times. The current owner, local businessman Ed Moore, purchased the hotel in 2016. The hotel is managed by Spruce Hospitality. The new management group is in the process of a multi-million dollar renovation project, with newly renovated guest and banquet rooms being top priority. The Queensbury Hotel, a member of Historic Hotels of America since 2017, dates back to 1926.